The heavy smog that has hung over Beijing for days has seen many patients turn up at the city's hospitals with respiratory complaints. 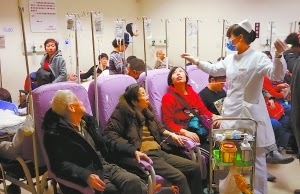 The Sino-Japanese Friendship Hospital was overflowing with patents on infusions yesterday and respiratory specialists said the worst was yet to come. The infusion room, where patients are given IV infusions was 100% full and there was an overflow 'ward' in the outside corridor where camp beds had been set up to cater for the extra patients and their families. Doctors said most of the patients had conditions such as pneumonia. The director of respiratory medicine at the hospital, Dr Lin Jiangtao said he expected the problem to worsen over the next week as the adverse effects of the smog tended to be delayed. The patients most affected were those with chronic obstructive pulmonary disease, asthma and heart disease, he said. The accumulation of pollution particles in the lungs tended to cause bronchoconstriction and chest tightness and other breathing difficulties, he said. The exact mechanism was not clear but China was now starting studies to investigate this process, he said. Authorities in China said this week that one seventh of the country was covered in the thick smog and it was expected to last for about five days.